Leading Manufacturer of crm software and crm for 5 users from Mumbai. Customer Relationship Management is a system that provides facility for an organization to store, organize and synchronize records related to customer interaction. Aria provides CRM that is very easy for any organization to improve customer relation and revenues. 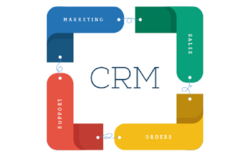 A CRM ( Customer Relationship Management) is a software product that provides facility to store, organize, syncronize records related to customer interactions. Aria CRM software allows to manages sales, inventory, ticketing activities, AMC in a single system.